Lock in a great price for Leoneck Swiss Hotel – rated 8.4 by recent guests! Close to shopping and restaurant area. Excellent breakfast. Close to Zurich Main HB. Tram stop in-front of the hotel. Clean, spacious. Staff were very helpful. Hotel provided a portable phone with free internet and international call facility which is as very thoughtful and helpful. Sibring (I know spelled incorrect) was fantastic. She was the night manager and took care of a mixup. We arrived late in the evening and she was so accommodating as we were so tired. Location was perfect Good view of sunrise/sunset Handy Mobile in room is the best thing I have seen in any hotel. You can take it with you anywhere in the city, free international and local calls, 4g interested. Amazing stuff. Very kind staff. Close to the central train station and the city centre. Clean rooms. We liked the breakfast very much! Thank you, everything was fine. The room was very nice. And the staff was really helpful. Tram was available right outside the hotel and some good restaurants were also nearby. The triple room is perfect. Everything is clean, location is perfect. I will book it again when I go back. Leoneck Swiss Hotel This rating is a reflection of how the property compares to the industry standard when it comes to price, facilities and services available. It's based on a self-evaluation by the property. Use this rating to help choose your stay! 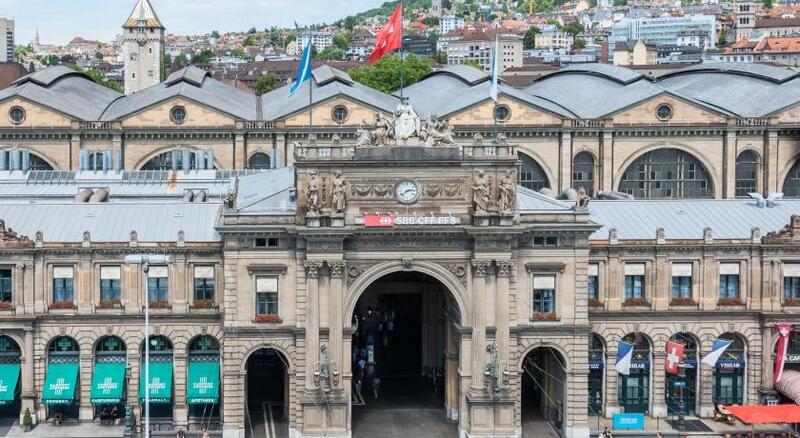 One of our top picks in Zurich.Just a 6-minute walk from the Zurich Main Train Station, the Bahnhofstrasse shopping street and the ETH Zurich University, the Leoneck hotel features a fancy ethnic style and offers you air-conditioned rooms with free internet access via the in-room tablet PC and an inviting restaurant. 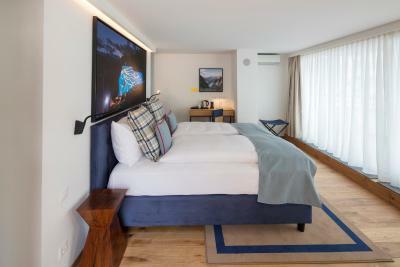 All rooms come with triple-glazed windows, a bathtub and a shower and free tea and coffee-making facilities. Free WiFi is available throughout the hotel and a business corner with a printer is available as well in the lobby. The restaurant 8001 offers a rich American breakfast buffet, business lunches and a large choice of Swiss specialties for dinner. Tram line no. 10 directly connects the Leoneck to the airport (30 minutes) and to the main train station. The Haldenegg tram stop can be found right beside the hotel. 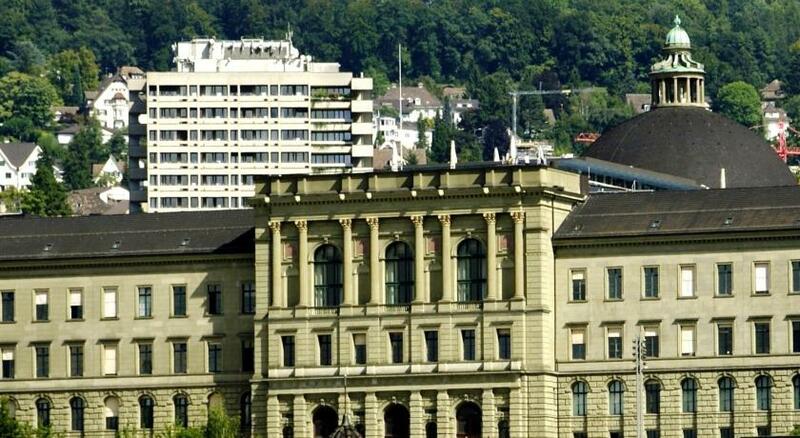 The main shopping area, the bank and business district, the University/ETH and hospitals are easily reachable. 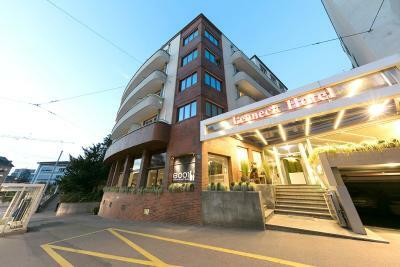 When would you like to stay at Leoneck Swiss Hotel? Room with attached bathroom with bath and shower, a kettle and a selection of coffee and teas, triple-glazed windows, free WiFi, a tablet PC, a smartphone, air-conditioning, free local telephone calls and 1 bottle of water on arrival. These spacious rooms are equipped with a coffee machine. 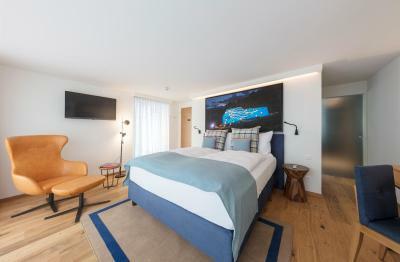 All rooms have triple-glazed windows and offer free WiFi, a tablet PC, a smartphone, air-conditioning, free local telephone calls and 1 bottle of water on arrival. These more spacious rooms offer free nonalcoholic drinks every day from the mini-bar, a coffee machine, a fruit basket on arrival, ironing facilities and a free late check-out until 14:00. All rooms offer free WiFi, a tablet PC, a smartphone, air-conditioning, free local telephone calls and 1 bottle of water on arrival. This double room has a flat-screen TV, air conditioning and iPad. This single room features a soundproofing, air conditioning and electric kettle. This suite has a soundproofing, cable TV and air conditioning. 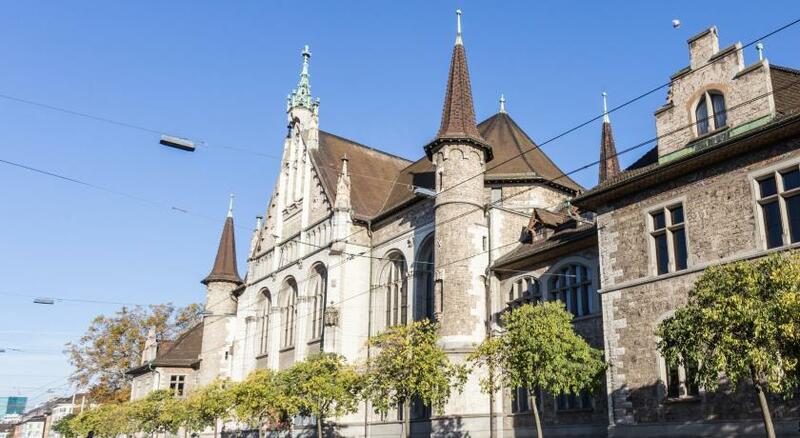 House Rules Leoneck Swiss Hotel takes special requests – add in the next step! Leoneck Swiss Hotel accepts these cards and reserves the right to temporarily hold an amount prior to arrival. Please note that the restaurant is not wheelchair accessible. Should not walk from main train station if you have luggages. Too many steps to reach the hotel . Need to take Bus. Perfect for short stays. Incredible breakfast. Clean room, nice view. The staff were very friendly and helpful. The rooms were quiet and well organised with fridge, kettle and mineral water provided. The bathroom through small, was thoughtfully planned which made it easy to use. Easy to travel to train station by tram#10 in frontof hotel. Welcome drink is good. Clean eoom. Coffe machine inthe room. Clean and Unique, friendly reception, good breakfast. Only stayed one night prior to flight. Room quite small but perfectly adequate and good value for money. Easy walk from station. Even easier tram stop across the road which takes you direct to the airport. Great location. Easy walk to the city centre. Bright clean rooms. In-room tea/coffee service and free drinking water. Digital guide.